Stargate SG 1 is a must watch for any and all fans of the science fiction genre. It's melding of action, drama, and of course science fiction is spectacular. The3 show also boasts a great cast, with actors such as Richard Dean Anderson and Amanda Tapping. With great writers and a killer story Stargate SG1 is perfect for all manner of science fiction fans. The show follows Dr.Daniel Jackson, Captain Samantha Carter, and Colonel Jack O'Neill as they explore foreign worlds. The travel is facilitated through a Stargate, a wormhole created between two points in space, and is funded by the military. The group initially meets an ancient alien race bent on the enslavement of the human race. These enemies provide some of the main suspense and character development in the SG 1 series. The enemies in Stargate SG 1 are quite interesting. The main enemy in the show, the Goa'uld, are heavily based on the ancient Egyptians. Their culture as well of their technology is indicative of the pyramids and ancient Egyptian religion. The other main enemy, the Replicators, are somewhat one dimensional however they still provide some interesting situations as well as some character development and drama. Overall Stargate SG 1 is a great science fiction television show. It provides a suspenseful and enjoyable experience for science fiction fans. The show has a great plot and decent character development as well as enough action and drama to keep anyone interested. Stargate SG 1 is definitely worth watching for any and all science fiction fans. When the Asgard decide to share all their knowledge and technology with Earth, they do so by incorporating that knowledge and technology into the Odyssey. However, the incorporated Asgard systems become a tracking beacon for the Ori and every time the Odyssey drops out of hyperspace it is attacked by the Ori.Finally, after numerous attacks, when just about to be destroyed, Carter uses the Asgard time dilation technology to slow down time in hopes of finding enough time to plan an escape from their certain destruction.However, can Carter figure out the impossible escape? And just how long will it take? Vala is forced to leave SG-1 when her prophetic dreams of the location of Merlin's treasure lead SG teams into a trap. Adria finds her mother and wants the now independent Vala to take her to the treasure. However, SG-1 and Baal have plans of their own. When the team arrive at an alien museum and are mistaken for rebels, they are forced to stage a bogus hostage situation to buy enough time to escape from the museum and the army gathering outside. However, an overeager security guard takes matters into his own hands, complicating matters. After the SG-1 team destroys a Lucian Alliance cargo ship filled with illicit drugs, a bounty is placed on capturing the entire team, which in turn sets several alien bounty hunters against each other to claim the reward.Mitchell reluctantly agrees to take Vala to his upcoming High School reunion, where is causes quite a stir. In the search for the Sangraal, SG-1 comes across Merlin himself frozen in hibernation. With Adria and the Ori tracking them down, SG-1 must help Merlin complete the weapon before it's too late. Daniel, with some insight from a dream Vala has had, determines the possible planet which might be the location of the Sangraal; the anti-Ori weapon. The search, however, turns into a maze of a journey where they must follow the prophesied path, as others try to beat them to their goal. Those dogging their path are both Baal and Adria, separately. Can the team survive the numerous traps set long ago by Merlin, the treachery of Baal and his troops, and the cunning guile of Adria to find the Sangraal in order to save humanity? The Earth ship Odyssey, with Carter aboard, gets tricked into a trap near a neutron star, only to find itself in a mine field when they try to escape several attacking Goa'uld Mother-ships. This leads to Vala and Jackson being kidnapped when the rest of the team goes in search of the Odyssey. It turns out a breakaway faction of the Lucian Alliance, lead by the leader, Anateo, is responsible. Anateo is attempting to capture the entire team, and then turn them and the ship over to Lucian people in a bid to take over control of the Alliance from the its leader, Netan.While the captured crew makes plans to take back over the Odyssey, Mitchell goes undercover as a cold blooded killer, in order to find out what Netan might know. The new leadership among the Jaffa decides to use the powerful weapon on Dakara to wipe out entire planetary life on other worlds in order to capture and build a fleet of Ori ships of their own. However, they have chosen a planet where the Ori / Vala offspring and SG-1 are on. Which will prove to be the more lethal, the Jaffa in their quest for Ori ships, or Vala's offspring, who is determined to find and stop the Jaffa's weapon? SG-1 gets pulled back into Martin Lloyd's world when he convinces the powers that be to let him talk to the team, as he is about to revive the Wormhole X-treme TV series as a big screen movie. He needs help with ideas from SG-1 to try to make the movie "real. " The team fights this, but Gen. Landry orders them to help, but says he will get them out of the meeting as soon as possible. However, when the General drags them out of the meeting, the gate activation breaks down, leaving them stranded with time to try to help Martin out with his project, to their dismay. The villain Ba'al makes a surprise offer to Stargate Command; he will help them locate the Ancient's super weapon, if they deal with his now troublesome clones. Although highly skeptical, they proceed to gather the clones up. Each clone, however, claims to be the real Baal.Once the clones are securely locked away in Stargate Command, Ba'al makes his move. There is something that he desperately needs, the access codes to the SGC's most sensitive files. Plus, Ba'al may have found an insider who can help him find the desired information. SG-1 travels on the Earth ship Odyssey to Atlantis to both try to dial in the "super gate" nearby, and to let Daniel continue his search for the anti-Ori weapon while staying at Atlantis.Things get tense as an Ori ship approaches Teal'c's position at the super gate, just as a Wraith hive ship approaches the Odyssey's position in the Pegasus galaxy, where they are trying to activate a gate connection to the super gate back in the Milky Way. Daniel discovers a gate address that might lead them to the weapon they must find to fight against the Ori. They travel to the planet in question, but find all the people in the village have died in their sleep a long time ago. Plus, it seems all the animal life around the village has died too. Soon the team realizes that they are being affected by the same disease which killed the population of the planet. They must stay wait at all costs, until they can fid a cureMeanwhile, Vala stays behind at Stargate Command in order to take a psyche test. If she passes, she can join SG-1 on its off world missions. However, things go badly, as she tries to game the test by studying how to respond to the potential questions she might be asked.Agent Richard Woolsey offers Vala a solution to her dilemma, but can she accept doing what he asks in return? Daniel and Vala must deal with the new born child (Vala's), who is aging rapidly to lead the Ori's Crusade. Vala returns to the SGC using the same body shifting device seen in "Avalon (2)." In a shift, she returns in the body of Daniel Jackson. She says she has important information to convey to the SGC. However, she digresses into a long diatribe about her time on her distant planet and its people's struggle there with the Ori, and she finally describes the new great threat to Earth. Also, Vala tells them of an underground resistances group on this planet that opposes the Ori. Carter tries to figure out what a strange device found in Merlin's cave does, after Dr. Lee failed to figure it out after six months. Carter finds something interesting, which unfortunately causes her and Mitchell to be transported to an alternate dimension. They can see and hear those around them, but no one can hear or see the two.Teal'c, meanwhile, goes with SG-12 on a mission to check on the Sodan, after a distress message is received. Once there, they find Volnek has been affected by a Prior and is now killing everyone in his group in a crazed frenzy and madness, after actually having died.The two story lines converge when Mitchell decides to go in his "out of sync" state with a second SG team set to rescue Teal'c and SG-12. When an SG team returns with a corn-like food stalk that has addictive, and mind altering effects, SG-1 is sent to investigate. They head to the planet where the corn-like food, known as kassa, is grown, but their investigation provokes an angry response from the Lucian Alliance that controls the food. While under fire from the alliance, and as they are attempting to dial home, the Stargate and DHD suddenly disappear, leaving SG-1 trapped.After SG-1 is later rescued from the alliance by Earth's newest ship, the Odyssey, SG-1 tries to find out who stole the gate. Gen. Landry decides to seek help from the Goa'uld Nerus. Nerus eventually breaks down, after some creative torture techniques by Gen. Landry, and tells them who stole the gate on the alliance's planet and several other gates as well.The answer shocks the team, and poses many additional impossible challenges to getting the gates back, but reinforces the need that they do, for the sake of Earth's future existence. The SGC learns that the Caledonian's arch enemy, the Rand government, has been visited by a Prior, who has offered them great weapons to defeat the non-believing Caledonians. The main weapon is a satellite platform which can destroy all of the Caledonians. The Prior is slowly giving the Rand government instructions on how to construct the satellite platform. There may still be time to destroy the weapon, as SG-1 sees that such a weapon could eventually be used against other non-believing worlds, too.SG-1 decides to take the Prometheus with them in an attempt to destroy the weapon, before its completion. Daniel travels through the gate to try to convince the planets leaders the evil of the Ori. However, Daniel is thrown jail as an enemy of the State, and the Prometheus receives a deadly surprise, once it arrives. Ba'al brainwashes members of the Jaffa High Council to thwart their move toward democracy. Cameron Mitchell faces a tough decision when he learns that an old friend is about to die. Earth now faces a world wide Pandemic caused by the Ori. However, Orlin's return to help Sam, and Earth, brings great relief, at least until they learn the downside to Orlin. Part of the SG-1 team is tasked to get the blood of the Prior that caused the infection, in hope it may lead to a cure to the plague. A Prior has convinced Gerak, leader of the Jaffa Nation, into following Origin. Teal'c and Bra'tac attempt to make a case against the Ori, but to no avail. Meanwhile, a plague released by the Ori has breached SGC and spread to the rest of Colorado. Gerak proposes to the high council that the Religion of the Ori should be adopted by all Jaffa. Meanwhile, as Carter and Dr. Lee search for sound frequencies to make the Priors unable to access the highly evolved parts of their brains, a Prior disease threatens to contaminate the whole country. A strange lab is found by SG-1 that was possibly used by Anubis. This lab contains an advanced human in cryo stasis. When taking him back to the SGC, the team and the rest of Stargate Command have to decide what to do with him. A lone Jaffa is found dead after a hit and run on Earth, and trying to find out why he was here, Teal'c heads to Dakara to question Gerak. They find out that Ba'al is inf act on Earth in hiding. Now the SGC has to deal with finding Baal on Earth and trying to stop Gerak's Jaffa from running around Earth looking for him while running the risk of exposing the Stargate program, as well. While trying to stop the Ori from getting a foothold in our galaxy, SG-1 loses a friend but gains an old one back. Daniel comes face to face with the Ori, the beings posing as gods in this new galaxy and unknowingly reveals the existence of life in our own galaxy to them.Back at the SGC, the bodies of Daniel and Vala are still unconscious, but Dr. Lam reports that they are back to being stable again for now. General Landry meets with Gerak, who is now basically the leader of the Jaffa nation, to start work on an official treaty. This is interupted, however, by Mitchell and SG-12 bringing back a prior through the gate.Daniel and Vala manage to get back into their own bodies in the SGC for a short period, just in time to tell everyone about the Ori threat that is now heading towards our galaxy, but are then sucked back into the Ori galaxy.After hearing about the Ori threat, Mitchell confronts the Prior, who sends them a message about the power of his faith. After this, Daniel and Vala get taken by the villagers. Seeing that their heart rates are rising rapidly again, Mitchell must quickly find a way to get them back into their own bodies. All of the original members of SG-1 have now left the SGC, and Lt. Col. Cameron Mitchell has now been given command of an empty SG-1, as a reward for the work he did in the battle over Antarctica (Episode 7x22). Mitchell tries in vain to get the original members of SG-1 back together, but none of the team seems to want to. That is until Vala Mal Doran, an old "friend" of Daniel's, comes through the gate with an interesting proposition.This leads the slightly smaller original SG-1 team, with Mitchell, in a new direction, away from the Goa'uld, and in search of more knowledge of the Ancients. Stargate SG1 is currently available to watch and stream on Showtime. 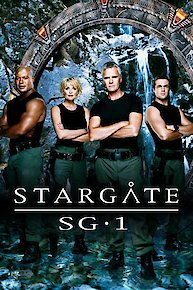 You can also buy, rent Stargate SG1 on demand at Amazon Prime, Amazon, Hulu, Vudu, Google Play, iTunes online.